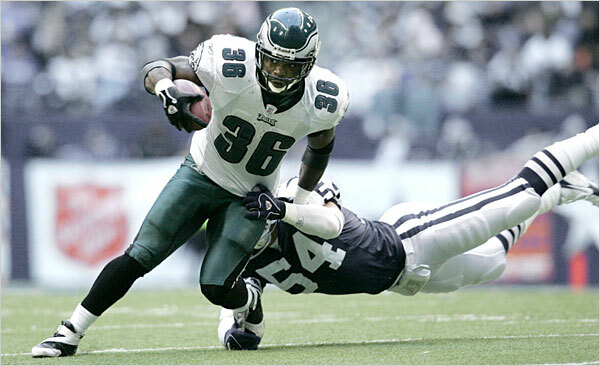 Brian Westbrook forged a pretty successful nine-year NFL career, mostly spent with the Philadelphia Eagles. Now the birds will repay that versatile service. Westbrook, an analyst for ProFootballTalk on NBCSN, will join linebacker Maxie Baughn as new members of the Eagles Hall of Fame, the team announced. “It means a lot to me. I mean it means a lot to my family as well,” Westbrook said. “I worked hard to be honored like this, and I played with a lot of guys that got me to this place. I just mentioned out there that they say how did you get here? Well I played with an awful lot of good players, and they made my job a lot easier. Westbrook, who rushed for 6,335 yards and 41 touchdowns in his career and posted a pair of 1,000-yard seasons, was the lynchpin for a lot of the Eagles offensive success. He also caught 442 passes for 3,940 yards and 30 touchdowns.